← Spices 101: What is Coriander? What is Cilantro? It can be a lot of fun looking through old cook books. Some recipes you look at wondering what people were thinking back then while others still sound really yummy. Though it’s usually pretty easy to tell the horrific vintage recipes at first glance, sometimes it can be harder to tell for sure which recipes have actually stood up to the test of time. That’s where our new recurring “Test the Recipe” posts will hopefully come to help. We plan to find recipes from vintage cookbooks/recipe cards/magazine cutouts, etc. and test them out. For the first run through we will follow the recipe exactly (barring any possible ingredients that are very hard to find/might not exist anymore in which case we will make the closest possible substitution) and see how it turns out. If it turns out good, then that’s it! Recipe is good to go and you can rest assured that you will end up with something yummy if you make it. If it doesn’t turn out good? Well then we’ll be revisiting the recipe and tweaking it and then posting our version of it as a “We Can Do It Better” post at a later date. 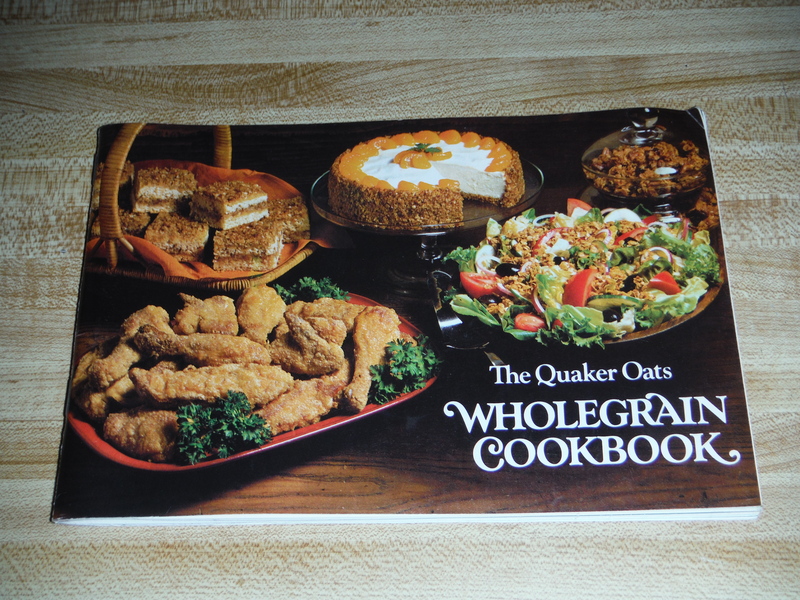 Our first recipe up for trial is from the Quaker Oats Wholegrain Cookbook from 1979. 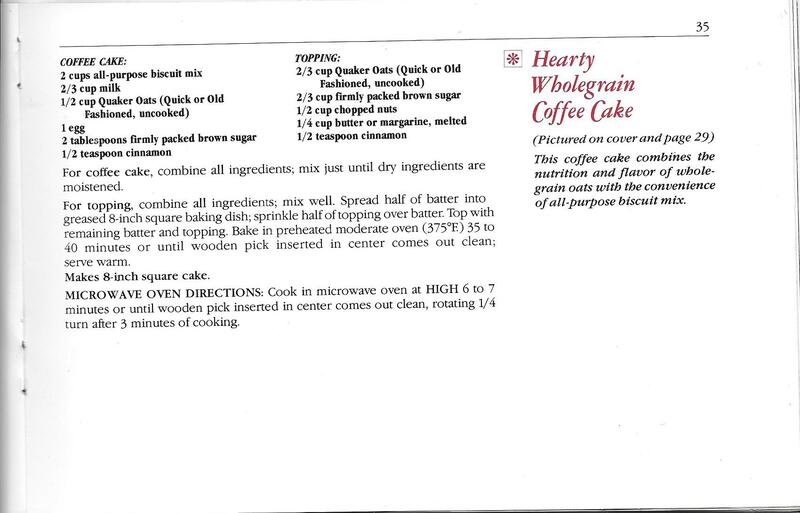 There’s a bunch of interesting sounding recipes in there, so we’ll probably test some more from there, but first up is the “Hearty Whole Grain Coffee Cake.” I enjoy coffee cake but hadn’t had any for awhile, so it seemed like a good place to start. First I gathered up all my ingredients. I opted to use butter since it’s been proven that margarine is actually probably worse for you than just eating butter. And also we didn’t have any margarine since we don’t use it. I was also a tiny bit short on chopped nuts, but I don’t think it made a horrible difference. Both the cake batter and the topping came together very easily. The instructions were clear and everything went smoothly. While I was pouring the batter into the pan I kind of felt like there wasn’t enough batter; I had a hard time getting it to cover the bottom of the pan, and then for the other half to cover all the middle topping. But it expanded enough while baking to be enough cake. When making this again I think I would try to put more of the batter on the bottom than I did, since my bottom layer ended up being a little thin. My layers certainly weren’t as even as the ones in the picture (you can see them on the picture of the cover). Though I tried to make it even, I think I should have put more of the topping in the middle. Ironically enough I think I had too much topping on top, since it was difficult to get a piece out of the pan without a bunch of the topping falling off, presumably because not enough of it got baked into the top of the cake. For anyone who plans on attempting the microwave instructions: remember that microwaves are a lot more powerful now than they were back in the 70s. You should probably plan on keeping a close eye on your cake as cooking times may have shortened now. Also if your microwave has one of the rotating carousels (which I feel like most do now) you probably don’t need to rotate the pan halfway through cooking. So, how did the coffee cake turn out? Pretty damn yummy! 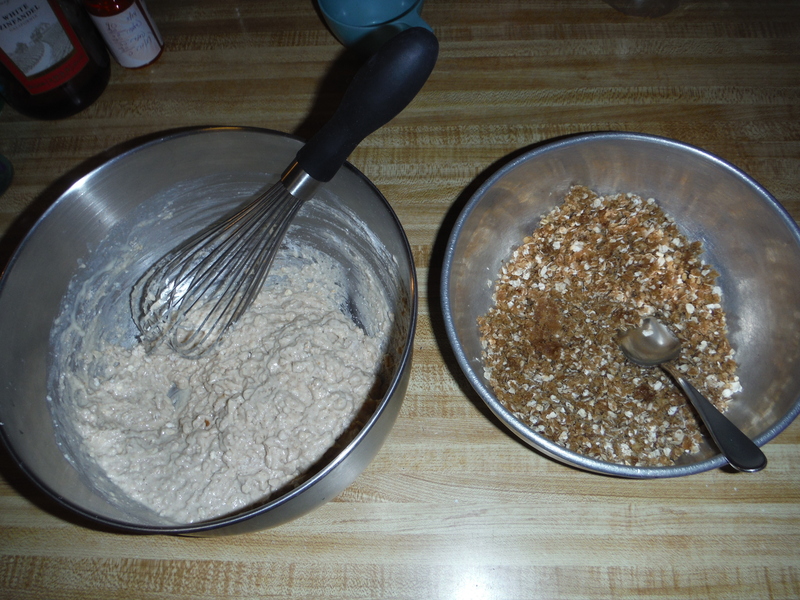 It is definitely very oat-y, which isn’t surprising considering it’s from a cookbook put out by Quaker Oats. But the oatiness isn’t a bad thing. It makes it more, well, hearty than a lot of coffee cakes. I think it makes a great quick breakfast. Considering the relatively small amount of sugar in it (less than a cup) and all the oats it’s probably one of the better “grab and eat” breakfasts you could have. It can be a bit messy to eat, but I think it’s worth it. Everyone who tried it agreed that it was yummy. The ingredients all check out for being easily obtainable and not terrible for you by today’s standards and it was easy to put together. There also wasn’t a ton of cleanup afterwards. Overall this recipe does stand up to the test of time and is good to go as is. So go make some coffee cake! 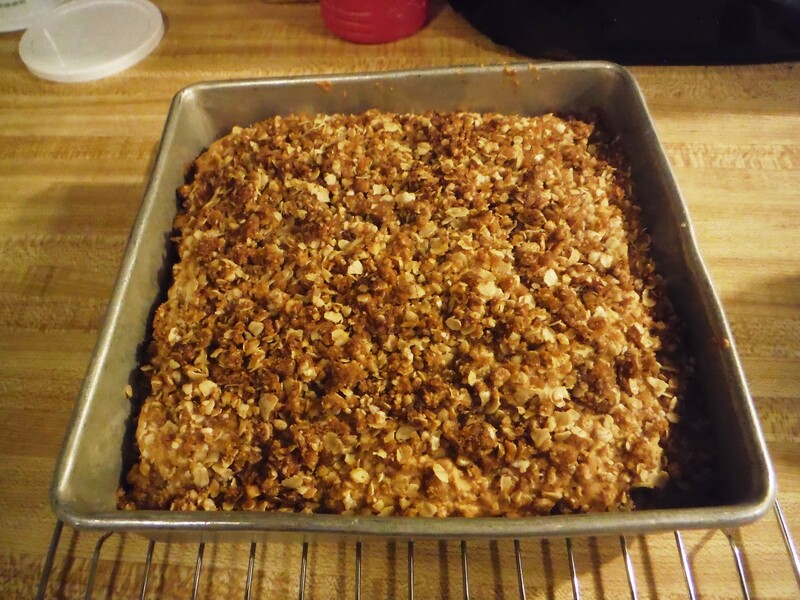 Posted on November 12, 2015, in Etcetera and tagged blast from the past, breakfast, brunch, dessert, easy, healthy, oatmeal, recipes, review, Test the Recipe, vintage, yummy. Bookmark the permalink. 4 Comments. You know what I do? I make it according to directions but add either a can of sliced peaches or some blueberries the middle with the streusel. I have always baked it in a conventional oven, the mike idea freaks me out a little. It is hard to spread, the batter is thick, but I find that most holes cover themselves up with baking. Thanks to your article, I can begin making this again. BTW, it is one of the few things I’ve ever made out of that book. Thanks again! I’m so glad I could help you make this again! I’m definitely going to try adding fruit to it the next time I make it – that sounds delicious! My story is similar to Juna’s. 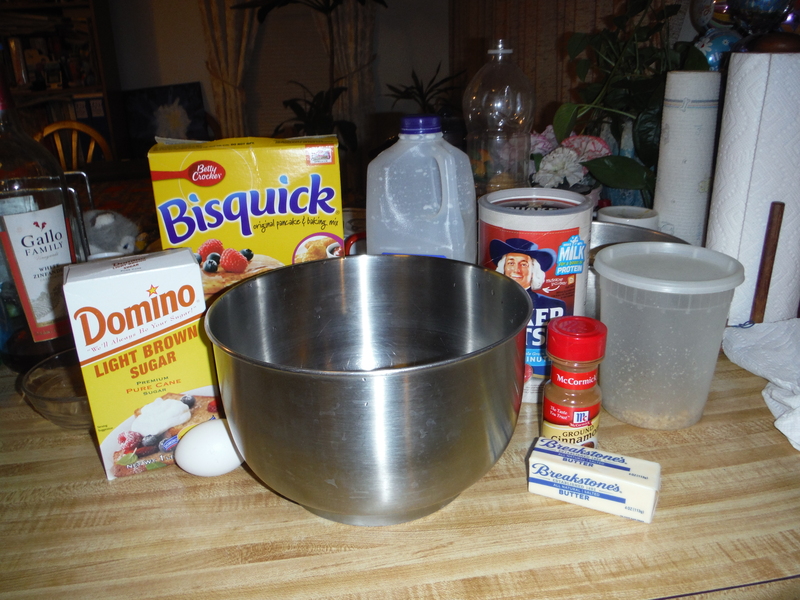 I “googled” the recipe and found your blog. 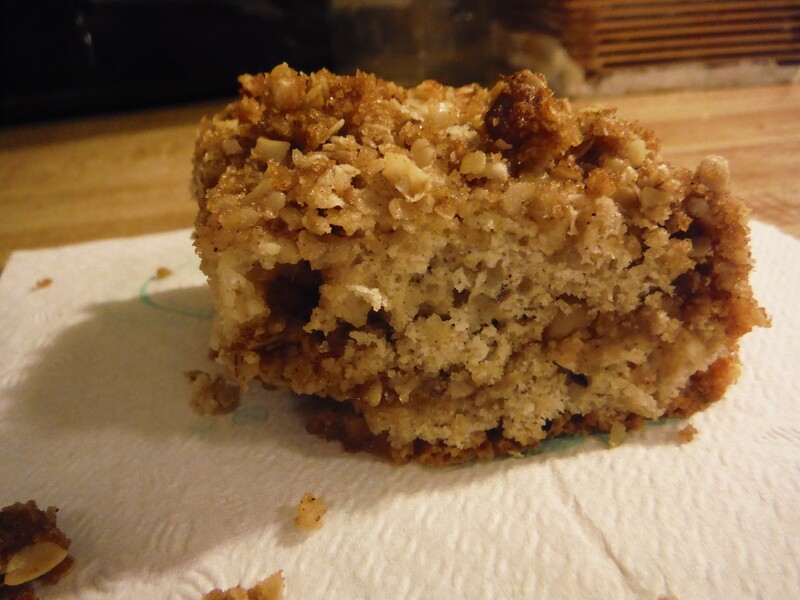 Thank you for posting the coffee cake on your blog. I remember sending away for the booklet in the mail, when I was a teenager. I’ve made some of the other recipes in the booklet. I like the Scottish Oat Scones made with raisins. Apple Cinnamon Golden Oats are a nice breakfast or side dish. The “Savory-Add-A-Crunch” is good as a crouton substitute and casserole topper. 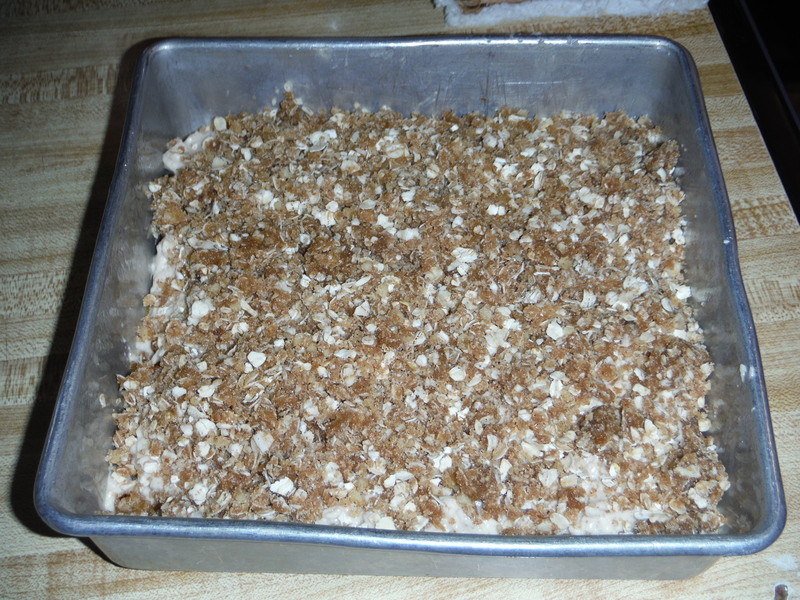 In the main dish section a recipe uses the unbaked “Add-A-Crunch” to coat chicken, then bake.